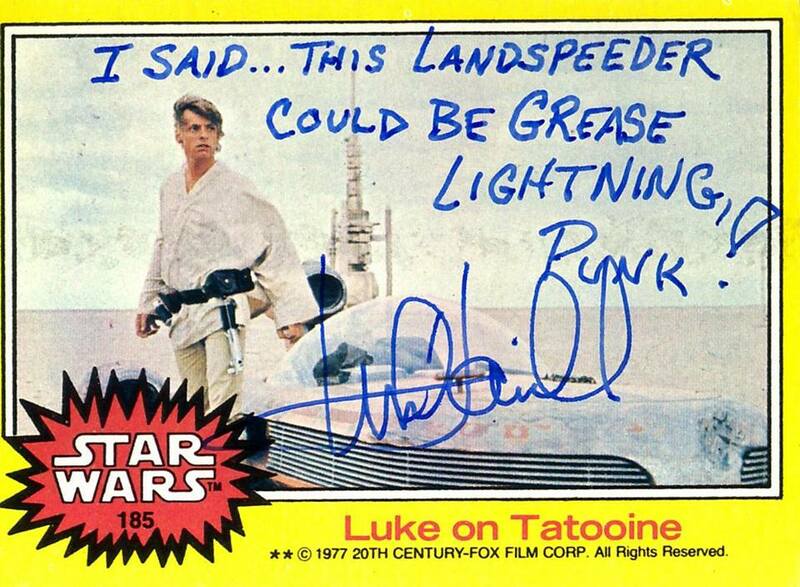 A collection of Star Wars trading cards signed by Mark Hamill will leave you laughing. One of the common dreams that many share is gaining a bit of fame. It's not hard to understand why. When you live on a planet with billions of people it only makes sense that some want might want to stand out from the crowd. The thing about actually being famous however, is that it rarely comes without a cost. Being recognized and fawned over can be fun, but it can also kind of stink when you can't walk fifteen feet down the street without someone asking for an autograph. It's hard not to wonder how some celebrities keep their sanity when dealing with these sorts of constant requests. 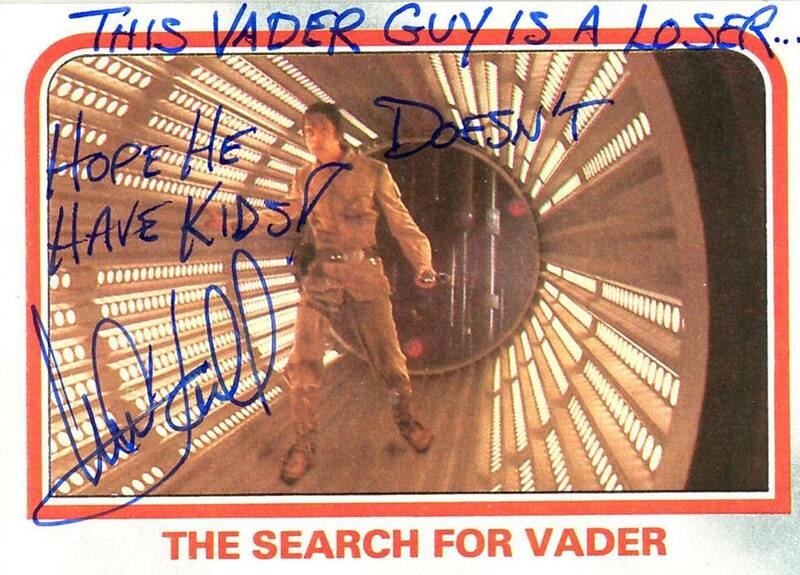 Actor Mark Hamill, it seems, decided to just have fun with the whole thing. 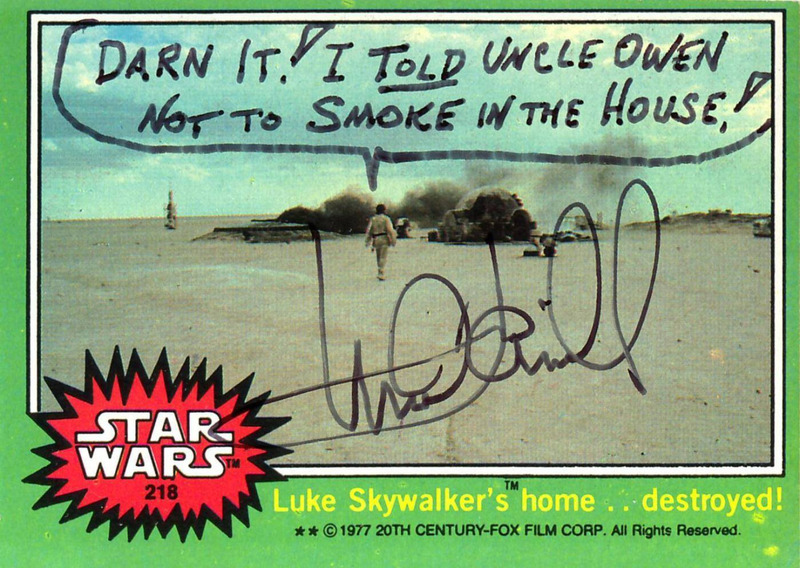 That, at least, is our takeaway from a gallery of autographed Star Wars trading cards where Hamill opted to spice up his John Hancock with a bit of snark and humor. 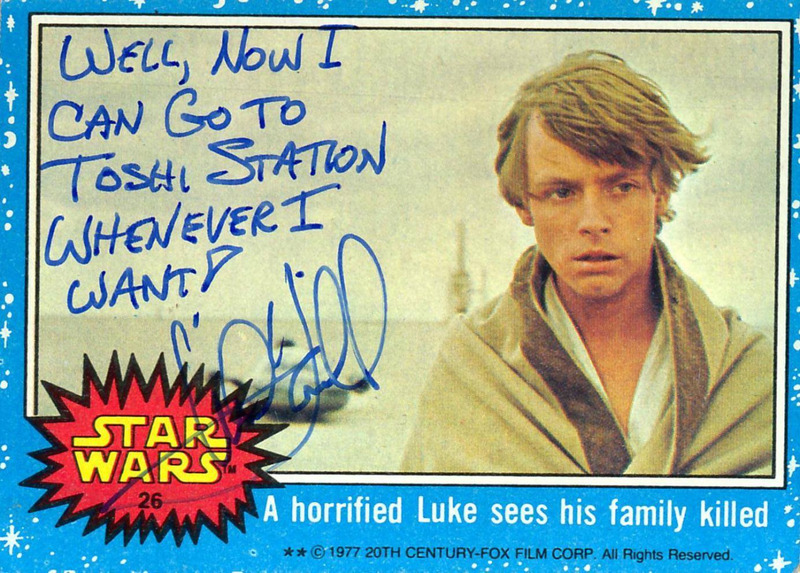 On one card depicting Luke Skywalker discovering his dead Aunt and Uncle, he added the quote "Now I can go to Toshi Station whenever I want!" 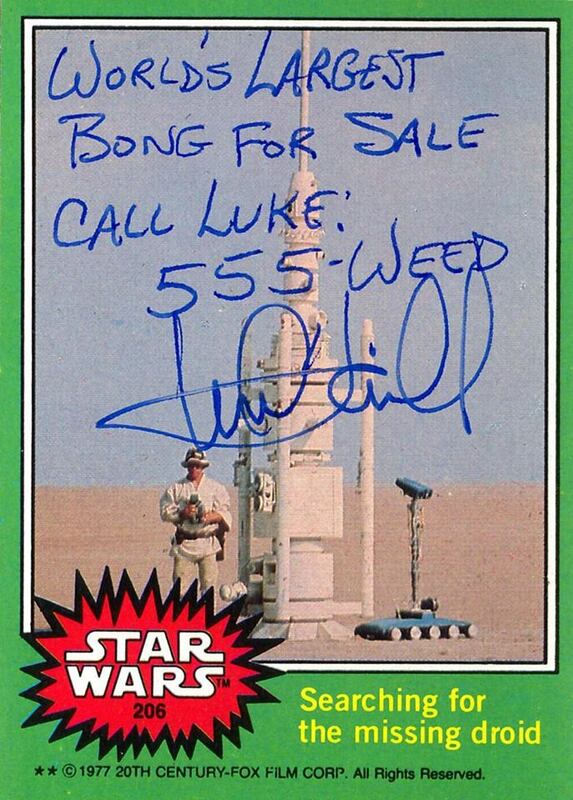 In another depicting himself standing next to a moisture vaporator on Tatooine, Hamill wrote "World's largest bong for sale: Call Luke 555-Weed." 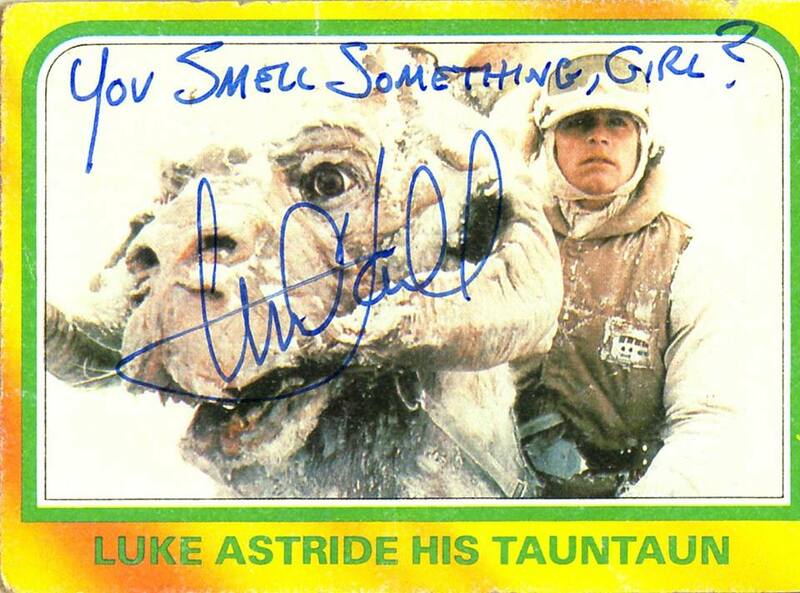 Perhaps the best of the bunch however, is a trading card depicting Hamill with George Lucas. 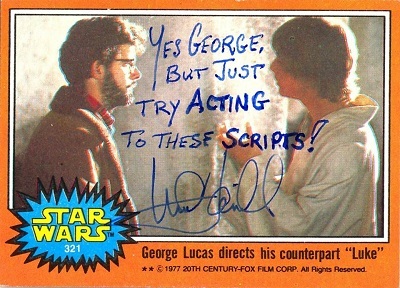 The card reads "George Lucas directs his counterpart 'Luke.'" Hamill responds by writing "Yes George, but just try acting to these scripts." Now obviously this isn't hard hitting news. That said, it's always fun to see a bit more of an actor's personality outside of their work and these autographs definitely offer up some solid evidence as to why Hamill might have done so well with comedy-tinged characters like the Joker. He obviously has a sense of humor all on his own.